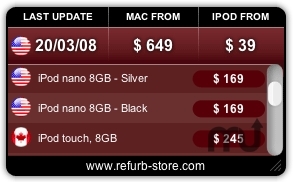 Preview currently available Apple refurbished products. Is there a better alternative to Refurb Store Widget? Is Refurb Store Widget really the best app in Arts category? Will Refurb Store Widget work good on macOS 10.13.4? Refurb Store Widget allows you to preview currently available Apple refurbished products. Choose products and countries you are interested in and view available products. Products' availability and prices are updated in real time. This is a must have if you want to save money! Version 1.0.2: Corrected a bug : in country chooser panel, Sweden, Luxembourg, Finland & Danemark were available while no refurb products are available in these countries. Version 1.0.1: Corrected a minor bug : in country chooser panel, Norway was available while no refurb products are available in this country. Refurb Store Widget needs a rating. Be the first to rate this app and get the discussion started!